Lady Nail LN208 | Light Your Nails! This is a terrific red! It's not too brown at all. Your pictures always show the polish as being very glossy, so I wonder if it's the polish itself or your top coat? Thank you Myishia! My photos are always without a top coat unless I state otherwise! This was so glossy without any help! I can never get bored of red haha It's such a gorgeous vamp color, I just cannot own enough reds. Fortunately I only like reds if they are creamy! These are my favorite kind of reds. It looks very nice on you. ooohh! Love this vampy shade! looks great on you! I love vampy colors especially in the winter! This color looks gorgeous on you, too. This one's a bit too brown toned for me but I do love the shine! I think it's not for everyone exactly because of that brown tone! this is lovely on you. A good color for fall! 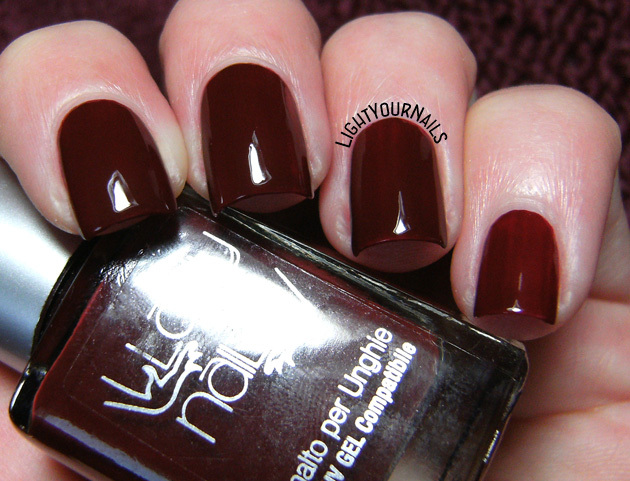 What a gorgeous vampy color! Looks so fabulous on you! Such a rich, beautiful color! Looks amazing on you! Mi piace tanto e trovo che abbia una bella finitura lucida!